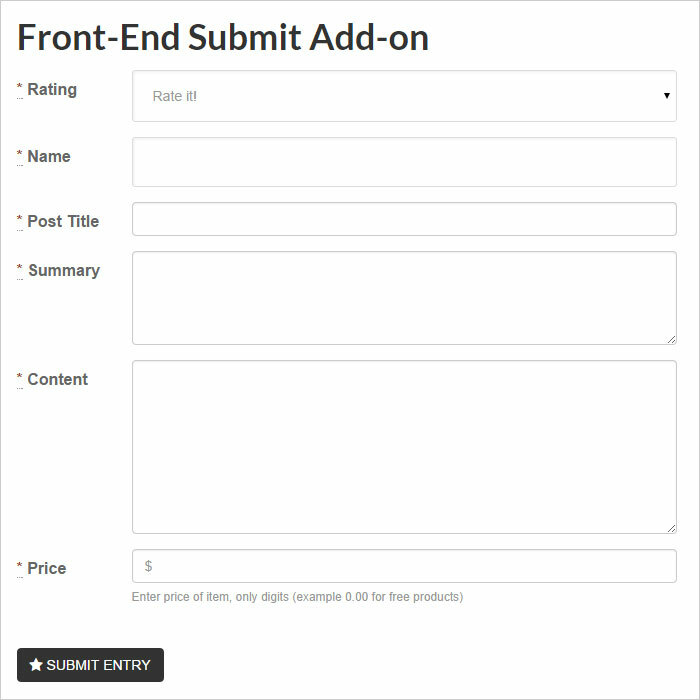 The Front-End Entry Submit add-on allow you to display an entry submission form on the front-end via a simple shortcode, which can be used by registered users to submit new entries to your website. Entries are saved as pending status, so that you can review them before publishing. cpt = “post”, custom post type. snippets_type = “Review”, rich snippets type. The Front-End Entry Submit add-on settings page give you control over some site-wide settings for the submission form generated via the add-on shortcode. Get email notifications by enabling the email notifications feature. Email notifications are sent to site admin email by default whenever there is a new entry has been submitted. however, you can use a different email if you wish. Within the form settings section, you can control what fields to enable on the submission form. Of course you can have several forms on your website, we recommend creating a specific page for each form.